The Veranda Restaurant exemplifies a true fine dining experience. Join us for an exquisite meal located just inside the main hotel. Enjoy elegant dining and a quaint place to unwind in the Tanner Dining Room or take in the breathtaking views of the mountains on the Veranda Terrace. Cool breezes, lakeside views, and the finest foods are just a few of the specialties offered by the Inn. Come hungry for our lavish Sunday Brunch, served from 10:00 am to 2:00 pm, and enjoy our "Build Your Own" Bloody Mary Bar from 12:00 pm to 2:00 pm. Present your room flyer and receive 10% off the Brunch price of $21.95 (children ages 6-12, $12.95, under 5 free). Tax and gratuity not included. 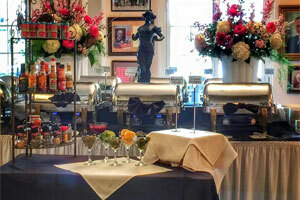 Please Visit our Sunday Brunch page to view additional details such as buffet items and pricing. The Veranda features chef-designed entrees served either indoors or on the veranda patio overlooking beautiful Lake Lure. Local favorites like rainbow trout, fresh seafood, and steaks are sure to please any palate. Treat yourself to an amazing value with the Lake Lure Dinner Special. Enjoy an appetizer, entree, and dessert for one great price. Join us the first Thursday of each month for a fantastic buffet menu with a variety of selections available and full bar service.